With new floor models for the Millbrook Beds’ Boutique collection proudly on display in the showroom of Furniture Village stores up and down the country, there’s never been a better time to get shopping for your new bed as Furniture Village have some amazing introductory offers on newly released models. 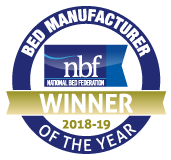 Our handmade Boutique range by Millbrook Beds is made exclusively for Furniture Village and features a collection of stylish divans and mattresses in spring counts ranging from 1200 spring counts and up to 3000 spring count in our most luxurious model. And, if you shop now, you can save over £500* on the Boutique 3000 divan set by Millbrook Beds as part of a special introductory offer from Furniture Village. So get down to your local Furniture Village store now and be introduced to luxury sleep courtesy of the luxury handmade Boutique collection by Millbrook Beds. * discount verified and correct at date of publishing.